Do You Have An Exhaust Manifold Leak? Wondering if your vehicle has an exhaust manifold leak? While the only way to be sure about a vehicle problem is to consult your local auto repair technician, there are some fairly obvious indicators that can help you isolate an exhaust leak, especially an exhaust manifold leak. 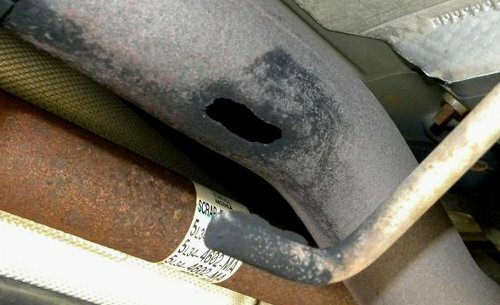 Does Your Car Have An Exhaust Leak? 1. While your engine is running, do you hear a “puffing” or “popping” noise? If you do, that’s a pretty good indicator that you’ve got a leaking exhaust manifold. Not sure what that might sound like? This video is a good example of a textbook exhaust manifold leak. 2. Do you smell exhaust inside your vehicle, even when you’re parked in a wide-open parking lot? Unless the wind is blowing exhaust directly into your car, exhaust smell inside your vehicle’s passenger compartment is a sure sign of a leak. An interior exhaust leak can be a dangerous situation – exhaust gases contain carbon monoxide, and carbon monoxide inhalation kills approximately 500 people each year in the USA. Shut off the heater or air conditioner – that’s only going to add to the problem. Open up all the windows so you get plenty of fresh air, even if it’s cold outside. 3. Do you hear buzzing or rattling coming from underneath your vehicle while the engine is running? If so, this could be an exhaust leak…but it could also be a loose heat shield. It’s something you want to have checked out, but it’s not necessarily a sign of a major problem. Some exhaust system leaks - like the one above - are really obvious and easy to find. However, many times leaks take a little bit of work to locate. 4. Can you see any exhaust system leaks? One of the best ways to check for an exhaust leak is to visually inspect your exhaust system while the engine is idling. Get your vehicle parked on some flat, level ground, and make sure it is in park and that the emergency brake is set. Next, grab a flashlight and lay down next to your vehicle underneath the driver’s door. If you can scoot under the car just a few inches (you won’t need to scoot far) you should be able to see the exhaust system very clearly using your flashlight. Look for gas leaking all along the exhaust system, as well as any holes or major rust. If my truck has an exhaust manifold leak will it hurt my engine? Eric – To my knowledge there’s no immediate risk. However, over time, it could be that hot exhaust gases vented into the engine compartment could damage other parts in the area. Additionally, vehicles with a manifold leak are much more likely to have exhaust gases in the engine compartment. SO, I’d probably get it fixed (or at least looked at by a pro) as soon as you can. In any instance that you have a 1999 or newer GM/ Chevy vehicle, the exhaust leak can be fixed by using an exhaust manifold repair kit. The best brand that I have used, as a mechanic, are the K.A.P.